The Internet of Things (IoT) will soon be everywhere—embedded in interconnected devices we’ll use every day. Already, cars, appliances, and wearables transmit real-time data to improve performance — and IoT devices can save your life. Consumer goods are just the tip of the iceberg. Amid projections that 30 billion smart devices will be linked in the near future, traditional companies such as Siemens, GE, and John Deere already making profound changes to management, strategy, and operations. For those who are ready, the opportunities are endless, and you can benefit almost immediately with less-costly first steps. 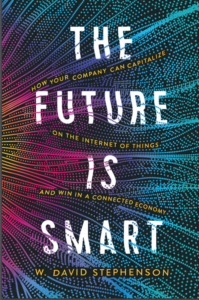 This big-think book reveals concrete actions for thriving in this new tech-enabled world. W. David Stephenson (Boston, MA) is a respected IoT strategist, consultant, speaker, and the author of a top-ranked blog, on the topic.